“Sun over Gudhjem” (literal translation Sun over God’s home) is a classic “smørrebrød” dish with a slightly confusing name until, that is, a kind soul informs you that Gudhjem is a town on the Danish Island Bornholm famous for its tasty smoked herrings and its beautiful beach. Tap the smoked herrings lightly with the numb side of a knife, making them easier to peel. Cut off the heads and the tails of the herrings and open them from the stomach. Begin by removing the backbone and thereafter ALL the other bones – even the tiny hair-fine bones which can hardly be seen but can be very irritating in your mouth or throat. Peel the skin of the herrings and divide the meat into nice-sized pieces (4-5 cms). Butter the bread and decorate each slice with the fish. Rinse the radishes and cut them into thin slices. Rinse the chives and chop them finely. 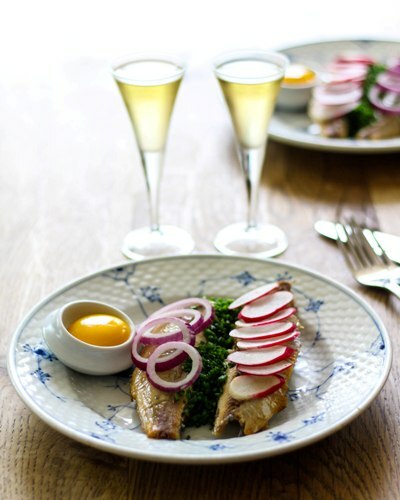 Decorate the fish with the raw egg yolks, radishes, red onion and the finely chopped chives. We normally put “Sol over Gudhjem” on the specials board in the late summer (from the beginning of July to the beginning of September) when the fat summer herrings have taken the Nordic seas, guaranteeing juicy, flavourful herrings. At other times of the year the herrings will often have been deep-frozen and tend to be dry and tasteless. We use fresh, unpasteurized egg yolks because they taste the best – and Danish eggs have been declared Salmonella-free by the Danish Health Authority. Use pasteurized eggs if you are in doubt. We recommend a home-made aromatic fir and pine aquavit and a fresh, slightly tangy New York Lager from Nørrebro Bryghus to accompany the “Sol over Gudhjem”.